Luther’s Theses was a numbered list of propositions centering on his argument that the pope was unable through indulgences to actually remit the penalties or the guilt for sins. Although Luther makes some good points, his arguments are from the perspective of someone who was still a Catholic, so that they still sound Catholic compared to teachings that would later come from the Reformation or even from Luther himself. On this quincentenary of the Protestant Reformation, a legitimate question to ask is, Did the Protestant Reformation succeed in its reforms in bringing doctrine and practice in line with the teachings of Christ and His apostles? My answer is an unequivocal, No. As its name suggests, the original goal of the Protestant Reformation was to reform the Catholic Church by protesting its worst abuses. This was a very weak start that forever skewed its course and impeded its progress. The Catholic Church’s vicious response to the Reformers soon forced them into breaking away from their mother church, but they carried with them its patterns, doctrines, and practices. Rather than making a clean break, discarding these things as useless, and starting afresh with the Bible alone, they tried to fix the old Catholic beliefs. Disagreeing over how best to do this, they very quickly fragmented, but all retained some likeness of the church from which they came and most retained the conviction that the Catholic Church was, however corrupt it had become, a manifestation of the true church. They had to do this, by the way, to maintain their idea of clergy. All of the early Reformers had been ordained in the Catholic Church. If the Catholic Church was entirely illegitimate, the Reformers would have no claim to being legitimate clergy. They believed that their ordinations obtained their validity from a line of succession going back to Jesus and the apostles. So, however faithless and wayward the popes and bishops were, they still rightfully held their offices as successors to the apostles. Some Protestant theologians later rejected the notion of apostolic succession, instead basing the apostolicity of their clergy on their faithfulness to the teachings of Scripture. This still left Protestants with a church that was merely an image, however altered here and there, of the Catholic Church. The problem, as I’ve brought out in other articles, is that nothing about the institutional church, either Catholic or Protestant, connects it to the ekklēsia (assembly of called-out ones) that Jesus began and continues to build. The Bible says nothing about the institutional church we see around us. Even before the Reformation, some few people rejected the Catholic Church, usually having to live in remote places as a result. When they learned of the Reformers, they made contact with Luther, Zwingli, and others in the hope of working together. In some cases there was dialogue and even cooperation for a time. Church-state relations and the directly related practice of infant baptism soon became the sticking point. The church-state system that came from the Catholic Church saw infant baptism as a way of maintaining its power: everyone was a member of both the church and the state. The church-state hybrid could keep citizens in line with threats of both earthly and spiritual punishment. Martin Luther admitted that Scriptural evidence did not justify infant baptism, yet, not seeing the inconsistency with other changes he made to Catholic doctrine, excused infant baptism by saying it had become the practice of the church and needed to be maintained. 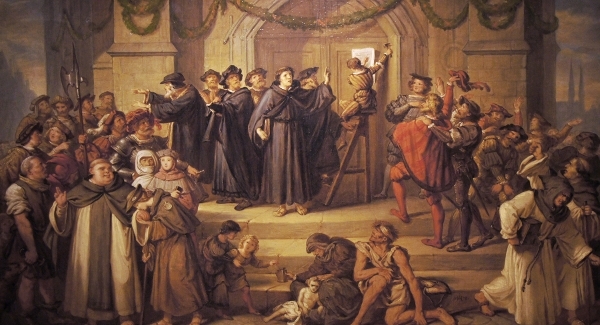 Ulrich Zwingli, the Reformer who held authority in both the church and state in Geneva, at first held the Radicals as friends and admitted to doubting infant baptism. But he later withdrew this opinion and persecuted the Radicals. He even approved of the execution by drowning of the Radical Reformer, Felix Manz. Disappointingly, as time went on, even the people of the Radical Reformation started conforming to the basic Protestant church model, though they still maintain the separation of church and state and reject infant baptism. The problem with the Reformation was that it could never arrive at pure biblical doctrine, ecclesiology, and practice as long as it insisted on using the materials (doctrines and practices) it had inherited from the Catholic Church. The entire idea of the institutional church is in itself a departure from biblical teaching. You will not find the church as we know it in the Bible. And so, on this five-hundredth anniversary of Luther’s hammer stroke that was heard round the world, here are fifty-one theses you may find somewhat more radical. 1. The Reformation never went far enough. Protestant and Evangelical churches are institutions that were cast in the mold of the Roman Catholic Church. 2. All true believers are the ekklēsia, but the churches keep them ignorant of its nature and function. 3. The institutional church cannot be restored to purity or to its biblical foundation because it has never had purity and does not have a biblical foundation. 4. New Testament assemblies are not worship services. 5. The Magisterial Reformers should have listened to the Radical Reformers (often given the epithet, Anabaptists) when they taught believer’s baptism and the separation of church and state. Unfortunately, some Radical Reformers also taught violent rebellion and a form of Dominionism. 6. The New Testament teaches nothing about a clergy. The prevalent clergy/laity distinction runs counter to Scripture alone. 7. Men may serve in the ekklēsia as elders. Elders have several functions as servants, such as shepherds, overseers, and stewards. 8. The invitation system/altar call is not found in the Bible, is contrary to Scripture on several points, and causes confusion. 9. Neither Hebrews 10:25 nor any other Scripture commands Christians to attend church. Propagandistic messages that try to lay guilt on believers so they will attend church each week have no biblical support and are contrary to the Gospel that frees us from guilt and any obligation “except to love one another” (Romans 13:8). 10. In Prelude on the Babylonian Captivity of the Church, Martin Luther first named the pope as the Antichrist. But, just as John wrote in the final hour of the covenantal relationship between God and the Jewish nation, “as you heard that the Antichrist is coming, even now many antichrists have arisen” (1 John 2:18), so we again have many antichrists. These falsely pious, worldly, and blind leaders deny the Son by not accepting all that He came to accomplish in the flesh, especially that He entirely fulfilled and ended the law and completely accomplished our salvation apart from any works on our part. These antichrists hold the people of the ekklēsia captive while God says, “Come out of her, my people” (Revelation 18:4). 11. The faith delivered to the saints and national patriotism must not be confused. God has put the rulers and civil laws in place merely to keep order among the carnal and sinful people. Aside from ancient Israel, which is no more, God has never and does not now favor any nation. “God doesn’t show favoritism” (Acts 10:34; see also Romans 2:11). We must not confuse love for or service to our country with love for or service to God. The Bible pictures the nations as beasts. 12. While the separation of church and state does not mean the abolition of religious expression from public life, still those Christians who work against the separation of church and state and for Dominionism/Reconstructionism/Theonomy or Kingdom Now goals fight against Christ who founded the ekklēsia as a body entirely separate from any earthly nation’s government. 13. Those preaching moralism are preaching a message contrary to the Gospel. Moralism is based on the law; the Gospel is based on grace. Moralism is a false gospel, which is really no gospel at all. 14. Politics is a carnal pursuit that can distract Christians from their calling, darken their spiritual vision, and weaken their faith. Jesus rejected Satan’s offer of worldly power that the church now vigorously grasps after. 15. Christian Conservatism is the greatest heresy of our time because it has turned millions of Christians from the centrality of Christ, grace, and love. It has deceived them with legalistic moralism, the hope of power through politics, and the idolatry of putting their trust in sinful humans. 16. Liberal Christianity is also a great heresy that replaces the Gospel and even Scripture with a message of social and economic equality through worldly political activism. 17. “The fondness of magistrates to foster Christianity has done it more harm than all the persecutions ever did” (The Writings of the Late Elder John Leland, 1845). 18. The Reformed teaching that the New Covenant is merely a new administration of the Old Covenant or that there are several administrations of one covenant of grace is entirely unbiblical. 19. The Reformed teaching that the Old Covenant was a covenant of grace is a classic example of cognitive dissonance (the mental state of holding two or more contradictory beliefs to be true). To say that a covenant of laws and punishments for their transgression is a covenant of grace is a hellish form of Orwellian newspeak on a par with the Party slogan in 1984, “Freedom is Slavery,” and the World War 2 death camp motto, “ARBEIT MACHT FREI” (work makes you free). 20. Under the Old Covenant, to not tithe was to rob God. Under the New Covenant, to demand the tithe is to rob God’s people. 21. When Romans 7:4 says the body of Christ made believers dead to the law, it means exactly that. Preachers have no right to put people under a law they are dead to. 22. When Romans 8:1 says, “There is therefore now no condemnation to those who are in Christ Jesus,” it means just that. Preachers must stop trying to lay guilt on the guiltless. 23. When Romans 10:4 says that Christ is the end or fulfillment of the law for righteousness to everyone who believes, it means precisely that. Preachers who point people back to the law are like children who turn street signs to confuse drivers. 24. Moses died on the other side of the Jordan from the Promised Land because he represented the law, which could not bring the people into the promised rest. Joshua (which is the same name as Jesus) had to lead the people into the Promised Land. Moses’ body remains on the other side of the Jordan and no one knows where it is. Let’s stop trying to find the law and dig it up. 25. Acts 15 does away with the law as much as it does circumcision (Acts 15:5, 24). 26. Jesus is our sanctification; our works are the result of His work. Those who preach sanctification by our works put the cart before the horse and logically deny what Jesus has already done for us. 27. We will see ourselves and our brethren grow when we take the Five Solas seriously and stop adding ifs, ands, or buts to them. 28. “By scripture alone” means without the church or the creeds or the pastor or anyone or anything else. Those who teach otherwise are not grasping the significance of what God is doing under the New Covenant. 29. “By faith alone” means that we receive the justification Christ has earned for us solely by trusting in Him alone without our works. 30. “By grace alone” means that our salvation—including our sanctification—is entirely by grace without our works or merit. It does not mean grace plus foreseen faith, it does not mean grace plus baptism, it does not mean grace plus sanctifying works, and it does not mean keeping God’s covenant and then receiving future grace. 31. “Christ alone” means Jesus Christ is the only mediator between God and man. “Through Christ alone” means that we are justified because of the atonement of Jesus Christ alone. Our works add nothing to what Christ has already done for us. And the teaching of some enormously popular evangelists and writers that people can be saved in the name of other gods when they serve those gods sincerely is an accursed lie. 32. “Glory to God alone” means that God is the only one deserving of glory. He shares that glory with us, but we have not merited it. Glory to God alone is contrary to any teaching in which man merits even a particle of his salvation. Yet, that describes much that passes for Christian teaching today. 33. The New Testament is superior to the Old Testament and has the authority to interpret it. 34. God never gave Adam a probationary period. 35. By choosing the tree of the knowledge of good and evil instead of the tree of life, Adam and Eve chose law instead of grace. 36. Israel under the Old Covenant was merely a type and shadow of the New Covenant ekklēsia or called-out assembly of God’s people. 37. The Bible does not support the notion that the law was parted into moral, civil, and ceremonial divisions. 38. The Ten Commandments have been fulfilled and ended by Christ as much as the rest of the Law of Moses. 39. The Sabbath as a day, whether seventh day or Sunday, is no more. It was a type of our true rest in Jesus Christ. 40. The New Covenant began with Jesus’ death on the Cross. The ekklēsia began on the Pentecost that followed. 41. Jesus Christ Himself is the New Covenant. 42. The law of Christ is really Jesus Christ Himself, living and working in us through the Holy Spirit. 43. “Church” is not the biblical word for either the body of believers called out of this world or its assembly. 44. “Ekklēsia” is the biblical word for the body of believers called out of this world and its assemblies. 45. The ekklēsia is not something we go to. It is what we are. 46. The Bible shows that early Christians met in private houses. This choice, by the way, is what made them subject to persecution. 47. No church building is the house of God. We believers are the house of God. 48. Church buildings arose based on the pagan notion of the sanctity of places. 49. The Edict of Thessalonica (AD 380) made the faith of the bishops of Rome and Alexandria the official state religion, instituted the use of the title of Catholic Christians to describe its followers, and outlawed all private, non-Catholic meetings. This edict is foundational to all institutional churches, whether they call themselves Catholic, Protestant, or Evangelical; and it is a declaration of enmity against Christ’s ekklēsia. 50. Church covenants and membership policies are unbiblical, legalistic, stifling, contrary to the grace of the New Covenant, confused in their ecclesiology, and easily lead to spiritual abuse and cultism. 51. In 500 years, the Reformation churches have managed to challenge Catholic corruption and false doctrine and authority, return to many important biblical truths, refuse to accept many other biblical truths, alienate and even persecute the Radical Reformers who also had many biblical truths, ally with the state whenever they could, shrink away from free grace and toward legalism, splinter into a multitude of factions, and return to corruption and false doctrine; and they are now trying to regain authority.